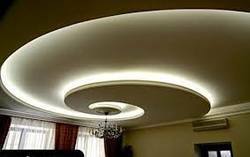 With our immense domain expertise, we are offering quality range of Curved Ceilings Gyp, which are available in various color combinations and outstanding designs. Our offered ceilings are widely used in residential and commercial sectors due to its features like resistant to fire & moisture and durability. These are designed and developed using high grade raw material and sophisticated technology. Moreover, these can be customized in accordance with clients’ specifications and are available at market leading prices.